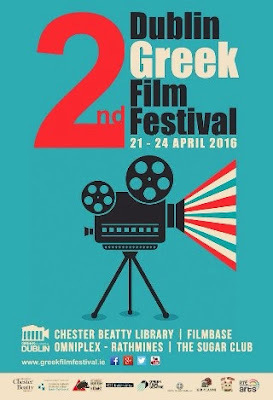 The Second Dublin Greek Film Festival came to an exciting conclusion this evening [24 April 2016] with a fundraiser in the Sugar Club on Leeson Street for refugees in Greece. For the past few days, this festival has presented features, documentaries and short films along with special events in top cultural venues in Dublin, promoting Greek culture through a variety of films and events and showing the links between Ireland and Greece. The evening’s fundraiser, which was well-supported by members of the Greek community in Dublin, included a showing of the documentary A Family Affair and a concert by Pakaw! The film A Family Affair is an 82-minute documentary made in Greece and Australia last year (2015). It is directed by Angeliki Aristomenopoulou and is in Greek with English subtitles. This movie is an intimate portrait of the Xylouris family and their sacred bonds with the musical tradition of Crete. It follows three generations of musicians in this family who uphold and pass on the vibrant tradition of Cretan music, performing ceaselessly to followers around the world. From the legendary Antonis Xylouris – widely known as Psarantonis – to his son, the famous lute player and singer George Xylouris – nicknamed Psarogiorgis – and his three children Nikos, Antonis and Apollonia, who are studying in Australia, the film follows Greece’s most famous musical clan to discover the electrifying power of their music and the sacred ties that hold the family together. We were brought on a musical odyssey from Archanes and Iraklion in Crete to Brussels and to Melbourne in Australia. There was an interesting interplay too with Irish music in Australia through connections with George’s wife Shelagh, and there was a cameo appearance by Ross Daly, who in a unique way bring together music from Crete, Ireland and the Middle East. All profits from this evening’s event are going to Γιατροί Χωρίς Σύνορα (Doctors Without Borders), working with refugees in the Dodecanese, Lesbos, Athens and Idomeni. Doctors Without Borders or Médecins Sans Frontières (MSF) is an international medical humanitarian organisation formed by doctors and journalists in France in 1971. Today, MSF provides independent, impartial assistance in more than 60 countries to people whose survival is threatened by violence, neglect or catastrophe, primarily due to armed conflict, epidemics, malnutrition, exclusion from health care, or natural disasters. Right now, MSF needs doctors, nurses, Interpreters and other professionals for their missions in the islands of the northern and south-east Aegean and in Idomeni. Last year, 608,970 people arrived at the Greek Islands compared with a figure of 43,500 in 2014. MSF provides medical care and distribute relief items to refugees and migrants arriving in the Dodecanese and Lesbos or concentrate at the border with FYROM in order to leave the country. Since March last year, MSF is providing medical care in mobile clinics on the island of Kos and on nearby islands, where the 20% of refugees and migrants arrive and where there is no organised reception service, and so no access to shelter, food, medical assistance and sanitation facilities. Since June last year, MSF on Lesbos has been providing health services in mobile clinics, distributing hygiene kits and improving water and sanitation facilities in the camps at Kara Tepe and Moria. MSF also provides transport services with buses, so that people who arrive on the island – over half of the arrivals in Greece – do not have to walk 65 km to the registration centres. In Idomeni in northern Greece, MSF provides medical care with mobile clinics to people trying to cross the border with FYROM. In collaboration with other organisations, MSF has set up a short-stay camp and installed water and sanitation facilities along the border. In Athens, MSF provides medical care, psycho-social support and legal assistance to refugees who have been tortured. After the movie, there was a concert by Pakaw! – an all-female combo based in Britain that pushes the boundaries of traditional music. With Greek music at their core, these five tangy, opinionated, international women excite with their sultry vocals and there versatile musicianship. The members of Pakaw! are Katerina Clambaneva (vocals and defi), Paressa Daniilidou (accordion and vocals), Muzmee (violin), Olympia Tsarouchi (guitar and vocals) and Duygu Camurcuoglu (percussion and vocals). In the Greek calendar this year, Sunday next [1 May 2016] is Easter Day. Hopefully fundraisers like this will bring some rays of hope and new life to an increasingly desperate situation that is an indictment of all of European society today.